ZcannTab is the perfect solution for hemp users who are looking for an alternative to messy oils or those looking for higher bioavailability than pills or capsules. 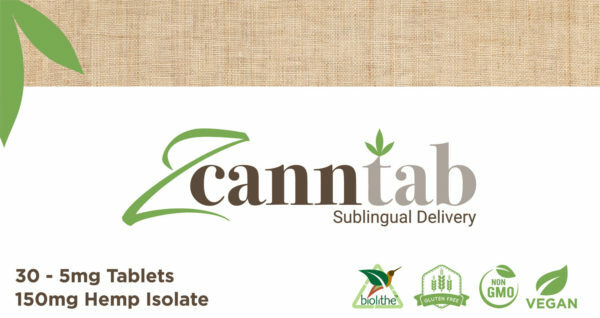 Zcanntab is refining hemp delivery. Hemp-based solution for wellness. Does not contain Wheat, gluten, soy, animal or dairy products. Fish, shellfish, peanuts, tree nuts, eggs, ingredients derived from genetically modified organisms (GMOs), artificial colors, artificial sweeteners, or artificial preservatives. 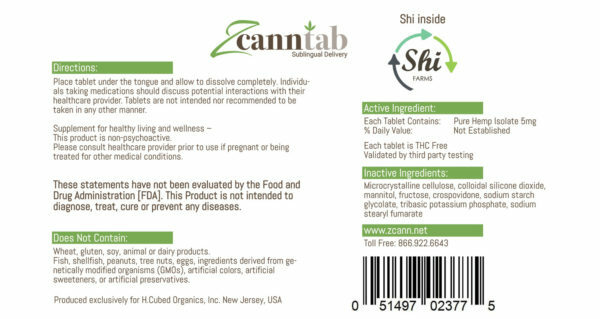 Allergies If you are allergic to hemp or any of the product ingredients, do not take Zcanntab. Disclosure These statements have not been evaluated by the Food and Drug Administration [FDA]. This Product is not intended to diagnose, treat, cure or prevent any diseases. Return Policy Upon delivery of your order, please check product carefully to ensure it has not been damaged during shipping. All claims for damaged product must be made within 48 hours. Please contact us and provide detailed information for any product damaged during shipping within that time. Please include a full description of the damages to the product. All refunds will be issued via the original method of payment within 10 business days.